OROVILLE, California, February 19, 2017 (ENS) – The emergency at California’s Oroville Dam appears to be over for the moment, although during the next few days severe weather is expected to hit the area at the western edge of the Sierra Nevada mountains, as hundreds of thousands of residents return to their homes. For California, it has been either too little water or too much. After four years of crippling drought, storms and flooding are now putting Californians at risk. About 188,000 residents near Oroville, were ordered to evacuate February 12 after a hole in an emergency spillway in the Oroville Dam threatened to flood the surrounding area as it flowed into the Feather River. The state Department of Water Resources says that today flow from the Oroville Dam Flood Control Spillway is expected to remain at 55,000 cubic feet per second and continue to outpace the inflow of water expected from approaching storms. 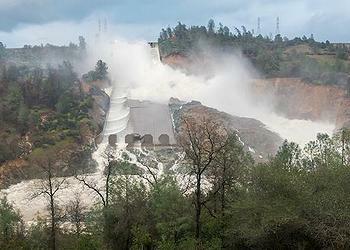 “The reduction in flow has allowed assessment teams to view debris buildup and dredge debris piles below the flood control spillway,” the DWR said in a statement. Oroville Lake elevations continue trending downward and had fallen to 852 feet, by 4:00 Sunday morning, 48 feet below the emergency spillway. As runoff flows into the reservoir, water levels will likely fluctuate but will remain within acceptable and typical levels during times of storm activity, said the DWR. Bill Croyle, acting director of the Department of Water Resources, which has responsibility for the Oroville Dam, said dam operators are prepared to increase flows again should the series of storms forecast to pelt the Sierra Nevada watershed with rain and snow over the next week come in stronger than expected. DWR continues to work on the area below the spillway, the monoliths, access roads, and eroded areas created by emergency spillway runoff earlier this week. DWR continues to monitor the status of the dam, spillways, the Hyatt Power Plant, related structures, and progress of repair activities. While most of the 188,000 people who fled their homes near the dam have returned, an evacuation center will remain open at the Silver Dollar Fairgrounds in Chico. All other evacuation centers supported by Butte County will be closed. The American Red Cross workers will remain in place in the event that anyone has to evacuate their homes again. Local officials stated yesterday that the area remains under an evacuation warning and that residents need to be ready to leave their homes again if the situation changes. Governor Jerry Brown won approval for assistance from the Federal Emergency Management Agency, FEMA, which has approved both recent gubernatorial requests for federal assistance – one to support the response to the situation at Oroville Dam and the other to help with the impacts of January storms that caused flooding, mudslides, erosion, power outages and damage to critical infrastructure across California. “I want to thank FEMA for moving quickly to approve our requests. This federal aid will get money and resources where it’s needed most,” said the governor. On Sunday, February 12, Governor Brown declared a state of emergency to bolster the state’s response to the situation in Oroville and support local evacuations. The nonprofit South Yuba River Citizens League, the Sierra Club and Friends of the River warned years ago that the Oroville Dam, America’s tallest dam at 770 feet, was a disaster waiting to happen. In 2005, the three nonprofit organizations filed a motion to intervene in the Federal Energy Regulatory Commission’s relicensing of Oroville Dam. They cited potential erosion issues at the unarmored, ungated spillway, warning that it did not meet FERC’s Engineering Guidelines. “We’re in a new normal: climate change and extreme flood events will make unprecedented demands on our flood control system and waterways. We need science-based leadership for the sake of public safety and sustainable river management in Northern California,” Dardick said.